This bulletin announces a procedure for updating the navigation / audio unit’s operating system software. The following list of symptoms and related changes provides a brief description of which customer concerns the updates are intended to address. If the reported customer concern is not identified in the following information, performing the update procedure will not address it. It is important to read through and understand this information completely before proceeding. Symptom 1: Audio output is lost after a few minutes when listening to Sirius/XM satellite radio. Change: Logic update to provide proper Sirius/XM satellite radio operation. Symptom 2: Bluetooth feature becomes inoperative. Change: Logic update to provide proper Bluetooth feature operation. Symptom 3: HD Radio “freezes” after a few minutes of play. Symptom 4: Back-Up Camera “help lines” do not appear. Change: Logic change to have the assist lines appear 8 seconds from engine start. Symptom 5: Map location is inconsistent between Navigation display and iPhone when using the iPhone’s Google Maps with the phone connected to the USB port in console. Change: Logic update to show correct vehicle location on iPhone. Symptom 6: Roads or interchanges have the same name displayed multiple times. Change: Logic change to show only one road or interchange name at the same time. Symptom 7: Navigation function is slow to start when selected. Change: Logic change to eliminate Navigation system slow-starting condition. Symptom 8: No map display with key or ignition in “ACC” (accessory) position. Change: Logic change to allow Navigation system operation in accessory ACC mode. Symptom 9: No voice guidance provided from Navigation system after selecting a route unless the ignition is cycled off and back on again. Change: Logic change to stop voice guidance “Mute” function from defaulting to “ON”. Symptom 10: Steering wheel switch controls are inoperative with an iPod (MP3) player connected to the USB. Change: Logic change to allow proper steering wheel (satellite) switch functionality. Symptom 11: Incorrect Umlaut characters are shown on StarLink display. Change: Logic change to allow proper display of Umlaut letters. Symptom 12: No response from the soft touch keys on display. Change: Logic change to improve communication between display and internal CPU. Symptom 13: Back-Up Camera is displayed with shifter in positions other than Reverse. Change: Logic change to allow display with shifter in Reverse only. Symptom 14: “Line Diag” screen is intermittently displayed while driving. Change: Logic change to prevent display of the “Line Diag” screen. Symptom 15: “LIST” soft touch key is not displayed on Bluetooth Audio screen while using Bluetooth audio feature with an Apple device utilizing iOS8 software version. Change: Logic change to enhance compatibility with iOS8 software. Symptom 16: “Beep” sound heard when touching the bottom of the display screen where no function soft touch keys are displayed. Change: Logic change to eliminate beeping sound from inactive soft touch key screen areas. Symptom 17: Sirius/XM caution message screen is displayed in English even when French language operation settings are selected. Change: Logic change to make all messages display in the selected operating language. The following information provides procedures for verifying the current head unit operating software version number and when required, accessing and installation of the applicable update files. The affected F10 Navigation unit part numbers and Faceplate ID numbers are listed below. 2 empty 2GB, USB 2.0 storage devices (flash drives) will be needed to perform these updates. The devices should be dedicated to storing and transferring these updating files only. They also need to be no more than 4GB in size and contain a FAT32 file format before downloading update files onto them. IMPORTANT REMINDER: Read through and understand this procedure COMPLETELY before proceeding further. numbers identified during the Version Check procedure are prior to (or lower than) those shown on the table, proceed with the remainder of the software update beginning with Step 3. Switch the unit into “Diagnosis Mode” by pressing and holding the HOME button while pressing the “AUDIO/TUNE” button 5 (five) times. Verify the current versions according to the “Version Check List” table shown below on page 6. Use the down arrow to scroll to the bottom of the list for complete verification. If the software version is current (NU9011 for Legacy/ Outback NU9106 or higher for Impreza/ Crosstrek or NU9203 for WRX), press and HOLD the HOME button to exit the Diagnostic Mode to complete the procedure as no updates are necessary. If no updates are necessary then continue your diagnosis of the customer concern. If the Version ID numbers are prior to (lower than) those shown on the table below, proceed with Step 2, preparing the USB memory (Flash Drives) on page 7 then Step 3, the software update procedure on page 10. NOTE: If you determine the updates are necessary, the Version Check procedure will need to be performed again after the update installation to confirm the procedure was successful (Step 5, pg. 17). The Subarunet page shown above will display and contains links to the update files 1 & 2 for each model head unit. NOTE: Do not download any files at this point. The file download procedures are supplied later in this bulletin. The flash drives must be formatted before the Update Files can be downloaded onto them. Proceed to Step 2 below for the flash drive formatting procedure. VERY IMPORTANT: Before attempting to download any data files, confirm the PC and flash drives you are using are not infected with any virus. The flash drives will need to be formatted for FAT32 following the steps below. Install a flash drive into an available USB port on your PC. programs and files box, type “explorer”. NOTE: On SDS Notebook you may also press the My Documents button on the GUI Home Screen. As you type the word “explorer”, search results will start to appear. In the results, click on the “Windows Explorer” option under the Programs section. NOTE: Always confirm the device you are formatting is the USB Flash Drive. This drive may have various names assigned to it by the manufacturer of the device and may not reflect the drive name given in this example. Right click the picture for “Removable Disk” then select “Format”. When the “Format” dialog box appears, make sure that the option labeled “File System” is set to FAT32 and the Quick Format box is checked as well. Then, click the “Start” button. Click “OK” when the following window appears. The drive will start formatting and display this window when it is finished. Click “OK” to complete the process. Repeat the procedure above for the second flash drive. Now that the 2 flash drives have been formatted, the two Update Files must be downloaded, one to each flash drive as shown in the table below. Label the flash drives L/O1 and L/O2 for Legacy / Outback, I/X1 and I/X2 for Impreza / XV Crosstrek and W/1 and W/2 for WRX. Download the Update Files to your PC from the Subarunet links. The updates must be installed in order, drive “1” first followed by drive “2”. NOTE: Each downloaded Update File may contain 1 to 3 individual files. The screenshots below will take you through the steps required to get the selected Update Files onto your flash drives and ready to use. Update File sizes are quite large and depending on the speed capabilities of the computer you are using, may take some time to complete the download. Once the download is complete, you will need to locate the Update File, unzip it then save the unzipped version to your USB flash drive (Update File #1 onto drive “1”, Update File #2 onto drive “2”). NOTE: If you have not already done so, follow the procedure (Step 2 starting on page 7) for re-formatting (removing any existing files) your flash drive. 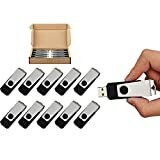 Plug the “clean” flash drive into your computer. Go to your Windows Start screen, select “Computer” (or click on My Documents if you are using the SDS Toughbook) then click on “Downloads”. Once your list of downloaded files opens, locate and click on the downloaded Update File (in this example, “OU9103_USB…”) you are looking for. TIP: If you click on Date Modified you can sort the downloaded files by the date they were added which will bring the newest file to the top. Double clicking the Update File will bring up a dialogue box with a security warning. Click on “Run” to continue. As shown below, click on “Removable Disk” which is your USB flash drive where you want the unzipped file(s) to be saved. Click “OK” then click on “Unzip”. The Update File will unzip and be saved to your flash drive. Confirm the Update File (and flash drive) is ready to use by going back to Start > Computer (or My Documents on the SDS Toughbook) and double clicking on “Removable Disk” to display the drive’s contents as shown in the examples below. Some Update Files will consist of just 1 item but others may list 3. All of the files will have a “.kwi” extension at the end of their file name. If OK, proceed with Step 4: Update Software Installation below. REMINDER: There can only be ONE Update File stored on each flash drive or the update procedure will not work. If you see more than one Update File stored, start over by re-formatting the flash drive again and reloading the Update File you are trying to install. Do not change the Update File names after downloading them. 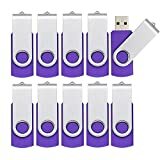 Do not save any other version Update Files onto the flash drives. feature when performing these updates. Once the GR8 is connected to the vehicle, as long as the battery is fully charged, it takes less than 3 minutes to boot-up the charger, select the Power Supply Mode, and have the vehicle’s battery voltage stabilized and ready for updating. America, Inc. (SOA). If the GR8 indicates the vehicle’s battery must be charged, charge the battery using the GR8 before proceeding to update the audio unit while using the Power Supply Mode. Once the GR8 has been connected and Power Supply Mode initiated, insert the Drive “1” into the USB port and follow the steps below to install the Update File #1. NOTE: Where applicable, record any radio station presets as they will be lost along with any mobile device pairing during this procedure. Turn the ignition / key (ACC) “ON”. The Select Audio Source screen will appear. Install the flash drive into the vehicle’s USB port. 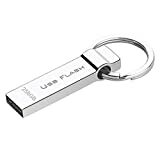 After the flash drive is recognized, the USB icon will illuminate. Once the USB icon is illuminated, switch the unit into “Diagnosis Mode” by pressing and holding the HOME button while pressing the “AUDIO/TUNE” button 5 (five) times. NOTE: The “OK” button will not activate (turn black) if the wrong Update File(s) are on the flash drive. Re-format the flash drive and reload the proper Update Files starting from the beginning of Step 2. If the progress bar stops, please wait 15 minutes. If the progress bar does not change even if after 15 minutes, turn ACC OFF and back ON again then, restart the update procedure from Step 4. IMPORTANT: Do not turn the ACC (ignition / key) off or disconnect the flash drive from the USB port during updating. Once the update completes successfully, turn the ACC off, WAIT 30 SECONDS then turn it back on again. After the unit boots back up, the “Updating software” screen and its status bar will be displayed. This update may take up to 5 minutes to complete. When the Software Update completes, the unit will restart automatically. Once the STARLINK opening screen is displayed, remove the flash drive from the USB port and turn the ACC off. Before proceeding further perform Step 1 (Version Check Procedure) again to confirm the updated software installation “from Drive 1” was successful. When the update is successful, the software version (NOR) NU9011 for Legacy and Outback, NU9016 for Impreza and XV Crosstrek and NU9203 for WRX and the CAN version 14.0012 (Legacy and Outback only) will be displayed. If OK, proceed with installation of the Drive “2” update (repeat Step 4, Update Software Installation). If the updated versions are not displayed, Step 4 using Drive “1” must be repeated. NOTE: If the CAN version displayed after the Drive “1” update is B2.0105, turn the ignition OFF, wait at least 1 minute, turn the ignition back ON and perform Step 1 (Version Check Procedure) again to confirm 14.002 is displayed. Once the software and CAN version updates are confirmed, insert Drive “2” to install Update File #2 and repeat Step 4. As mentioned earlier on page 6, once both update software installations are complete, the Version Check procedure must be performed again to confirm all of the updates have been installed successfully. Verify the current versions according to the “Version Check List” table shown on page 6. Use the down arrow to scroll to the bottom of the list for complete verification. NOTE: All presets will likely be lost and will need to reset after performing this procedure. Press and HOLD the “OK” button until the screen shown below is displayed (5 to 10 seconds). This screen will be displayed for about 1 minute while the unit restarts. After restart, the Loading screen and its status bar will be displayed. After the status bar completes, the Main Menu screen will be displayed. To complete the updating procedure, you must go through the series of Initial Setup screens, reset the radio station presets and re-pair any mobile devices (where applicable). 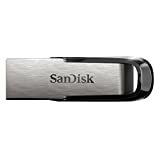 NOTE: After confirming the updates are complete, remove the labels and re-format both flash drives to clear any remaining files so they are ready for use the next time. This reduces the chances of inadvertently combining files the next time the drives are used. It also ensures that every repair receives the very latest software as these files will be updated from time to time whenever a newer version is released. NOTE: Up to $12.00 may be claimed ONE TIME in sublet to cover the cost for the 2 USB Flash Drives ($6.00 each). 100% RISK - FREE SATISFACTION GUARANTEE - 30-day money back guarantee 12-month warranty, let you confident with our charger cords. Free lifetime technical support, carefree service! If you have any problem,Please email us via [email protected], we will provide satisfied solution to you! WHAT YOU GET - 5 units of Pen drive with 30 days return policy and 1 year warranty on manufacturing defects. 【PHOTO or CONTACT BACKUP at ONE CLICK】Every time you plug the flash drive in, use the free App to backup photos/video at one click ,which will be automatically stored into the flash drive. 【PERFECT to PROTECT INDIVIDUAL PRIVACY】Password protect your data safe on iPhone flash drive. Open TouchID and Password on setting to secure your whole storage, or Lock selected files with password. 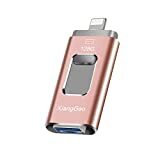 【HIGH SPEED FILE TRANSFERS】Directly plugs into your lightning port and USB port; 80 MB/s reading and 40 MB/s writing speed in USB end. Makes files transmission much easier on the go. Come along with eyelet holes. 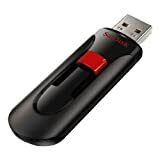 This swivel usb flash drive is a great device for storing data you need for school or your work. 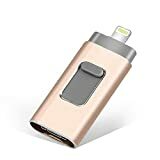 Waterproof USB Drive: This flash drive completely resistant to water, so can be used normally after drying the water invaded from outside, also it can resist dusty, static,magnetiism and high temperature. Metal Buckle: Metal hanging buckle design enables this flash drive to attach to your keys or a lanyard, makes it not only a practical tool for data storage, but also a piece of elegant decoration craft. Durable and easy to carry. Nickel plated aluminum surface looks pretty, and it ensures durable long-time usage and keeps your storage safety. Small size make it very easy to carry. Easy Installation. Plug and play, no need to worry about missing covers with direct access to the USB ports. 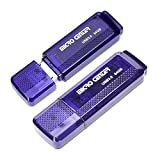 USB 2.0 super speeds to save time when transferring, sharing or storing files, easily to share your work files between computers. Wide Compatibility. Compatible with computers, smart TVs, music players etc. digital devices which come with USB ports. Are you tired of storing warnings on your mobile phone? Are you also worried about the lack of internal storage? It is a USB flash drive with three connectors that can transfer files for all Apple products. Multifunctional, small and large capacity storage is the first memory in the world that can transmit three connectors. XG flash disk 128GB you don't have to pay extra for additional storage, just insert it and enjoy the extra space of the device. 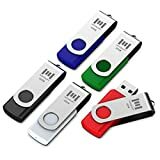 XG flash drives are excellent solutions for transferring files, videos and pictures back and forth from the iPhone and iPad as well as computers. I have Subaru XV 2019 from Canada. Head unit model G31 MID of HARMAN company. The head unit have FM frequency for North America. How I can change the factory setting for support FM frequency of Europa ? Hi did You found solution to change frequdnces to Eu? You need a Subaru subscription to get the updates now. Is there a specific Subaru webpage to get the subscription?